It was all but inevitable that I'd end up chasing and photographing steam trains around the great American West. While growing up, I lived a few short blocks from the old Chicago Burlington and Quincy mainline in the western suburbs of Chicago. My daily routine in those days was largely driven by the schedules of two of the premier name-trains of that era: The Great Northern`s "Empire Builder" headed for Seattle, and the Burlington`s "California Zephyr" on its way to California. Every day, I`d watch these two trains, and dream of riding them to the mythical West. I say "mythical" because, like many kids of my generation, my view of The West was driven largely by movies and television. I was a product of shows like "Sky King", "The Lone Ranger", and "Roy Rogers". The cowboy, as portrayed by John Wayne, was my hero. I knew in those days, with all the certainty of youth, that when I grew up I would move West. While I never quite grew up, I did move west in 1971, to a small mountain town in Colorado. There I discovered that The West wasn`t exactly what I`d seen in the movies - it was better. My fascination with trains and The West came together then as well, as I learned of Colorado`s rich railroad and mining history. I began to explore and track rail lines, both existing and abandoned, and to record them on film. 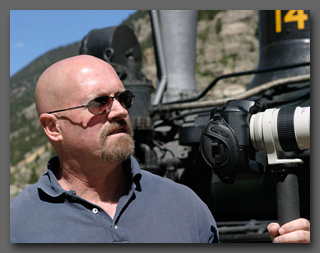 The passion for my subject has grown in the years since, as I`ve continued to explore and photograph historic railroads and artifacts. Along the way, my interest in photography has also grown, and after nearly 20 years working in marketing for a high-tech Fortune 50 company, I decided to devote more time to capturing images of places and things which represent a West that was. Western Steam Photography is the result.